“Raised by hard-working immigrant parents, Tony Cárdenas was brought up with simple ideals – that integrity and dedication were the keys to success. These are the qualities that he has brought to his career as a public servant, and continues to offer today as a United States Congressman. Rep. Cárdenas was first elected to the United States House of Representatives in 2012 for the 113th Congress (2013-2014). Now in the 115th Congress (2017-2018), Rep. Cárdenas sits on the prestigious House Committee on Energy and Commerce. In addition to being a member of Congress’s most established committee, Rep. Cárdenas is a member of House Democratic Leadership, elected by the entire Democratic Caucus to serve as the Caucus Leadership Representative, a voice for members who have served five terms or less. Before representing California’s 29th district in Congress, Rep. Cárdenas was first elected to the California State Assembly in 1996. He went on to serve three terms in the assembly and was later elected to the Los Angeles City Council, in 2003. 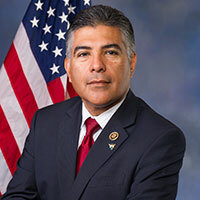 Having served over 20 years in public office, Rep. Tony Cárdenas made history, becoming the first Latino elected to represent the San Fernando Valley in the United States Congress. In Washington he continues his passionate commitment to his community.